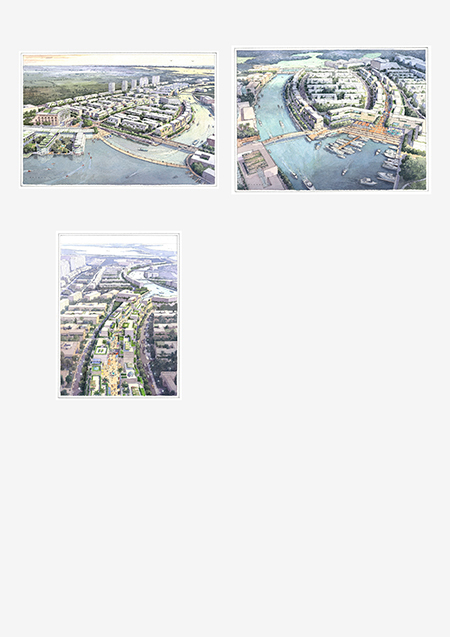 The El Gran Canal design project (part of our Serena Del Mar master plan), on the east side of the highway that connects Cartagena, Columbia and Barranquilla to the north, is conceived of as a vital seaside urban community. As such, it was organized around a major grand canal, similar in scale to Venice's Grand Canal, that extends into a series of urban-development clusters around its edges. This results in a clear hierarchy and a powerful sense of place. The project represents an unusual opportunity to address contemporary planning as well as design issues. We have embraced an urban design strategy that would guide construction carried out by individual developers so as to create a cohesive whole. A central ingredient in this strategy is a strong network of urban water features, which respond to needs for site drainage and integrate with the waterways that extend through mangroves to the coast of the Caribbean, and toward the historic center of Cartagena. Combining permanent residences, a hotel, and second homes for temporary residents, and a hospital/medical office complex for medical visitors, the overall design blends ideas for vital mixed-income community living and for vacation amenities, with a sustainability rationale that is centered on pedestrian and water-bound accessibility. In addition to the grand canal, the project's organization includes a boulevard/linear park, which also extends the entire length of the site, in a north-south orientation. The boulevard/park, modelled on Commonwealth Avenue in Boston, is lined by residential buildings, and public buildings, including schools, are placed within the park. A sole road entry to the community, from the highway, is on the north end, and leads across a causeway into the main civic area, which includes a piazza, one of two marinas, the hotel, a pedestrian retail street, and the hospital and related medical office buildings. The hospital and medical offices, a major attraction of the development, make up its northern anchor. They are bounded by a freshwater lake and landscaped hills to the north, and by the piazza to the south. The pedestrian retail street, a central axis between the boulevard/park area to the east and the grand canal to the west, extend from the piazza to the large, second marina to the south, midway along the length of the canal. The west side of the canal comprises parcels for office and institutional use, and the east side of the canal is lined primarily with residential units. A major regional retail complex is the south anchor. The community will feature a variety of housing types, with decked and terraced units along the grand canal and amid the stores in the central, pedestrian retail street area. On the eastern order, behind the boulevard/park, there will be six residential towers of between 15 and 20 stories each. Several pedestrian bridges will make the office and institutional buildings on the canal's western bank accessible by foot for people going to work from all residential areas across the community to the east. The canal, which varies in width from 60 to 70 meters, has a 0.5-meter tidal change, and is navigable for recreational boats and water taxis. The project is designed to the highest sustainability standards, with attention to sunlight exposures, shading, water recovery, and optimal green spaces, landscaping, and water placement in addition to the canal. With its emphasis on pedestrian and water traffic, and its regulation of automobiles to perimeter usage, or minimal usage for access to central residences, organization and design of the site aim to create, in the face of relatively high density, a sense of cohesive community as well as a feeling of direct immersion in the natural world around.